“The best known of many prehistoric settlements on Dartmoor, Grimspound dates from the late Bronze Age (about 1450–700 BC). The remains of 24 stone roundhouses survive here, within a massive boundary wall about 150 metres in diameter.” – English Heritage. “My colleague and I were in the mood for a ramble on Dartmoor with Grimspound as out main objectives. To reach it we had intended to climb Yard Hill beyond North Bovey and then proceed through Combe Farm and over Hookney Tor. Before arriving at North Bovey, however, a minister of the Methodist Church gave us a lift in his car along the road which includes a steady climb up Langstone Hill. The reverend gentleman was on his way to hold a service at Manaton, and we enjoyed our little chat with him before alighting at Langstone Cross. Our walk from this point through Heatree to the foot of Hameldown was most picturesque. Before passing through Heatree Gate we could see the wide, grassy track that would lead us up the slope of Hameldown, and we could also easily pick out the outline of Berry Pound, which was remarkably clear in spite of its covering of thick bracken. As I mounted the track the scent of bell heather was most delightful and the views as we climbed higher and higher were charming indeed. At one point we were high enough to command the combined view of Blackingstone Rock and Heltor, for I understand that they are rarely seen together from most points. I could also see spacious Easdon Tor with Haldon Tower beyond, Bowerman’s Nose. Honeybags and Haytor. On the other side was noble-looking Hameldown itself, and in between was the glorious Widecombe valley. From here to is a fine view of Moreton. I regard the grassy track to Grimspound as the pilgrim’s way of an ancient civilisation, for it is clearly defined, but it eventually narrows down to a moorland pathway through the heather, and following this we found that it led us right into Grimspound. Indeed, the sudden appearance of this aboriginal settlement came as a surprise. My impressions of Grimspound, of course, are those of a plain man who has been much impressed by it all. 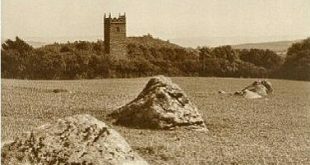 In my spare time I try to probe into the history of Dartmoor and take peeps into its past; but so far Grimspound, as one example, remains a profound enigma to me, as I am sure it has to many others. Still, it has conveyed some idea of the existence and habits of those very early settlers who carried on their calling and made their homes their. A fairly large portion of the area is free from buildings and I take it that this would be used for grazing when the needs arose, for the herds and flocks had to be kept within the confines. I understand the remainder of the area has 24 huts, half of which were dwellings and the rest cattle pens and store houses. Today, a large part of the pound is covered with heather, and on the day of our visit, by the way, there was an amazing abundance of whortleberries. In some of the pens the ground is covered with grass as smooth as a carpet. The centre dwelling which possibly occupied by the leader of this community, and which has a vestibule or forecourt adjoining, is protected by an iron railing. In this hut we enjoyed our tea, well sheltered from the wind: and I tried to imagine the domestic scene of long, long ago, with the occupants dressed in skins from their sheep, sitting around the fire which I fancy, would be a cooking hole in the floor. A centre pole would support the roof of thatch reeds or wood. The least imaginative of us naturally fell some interest in the daily lives of those ancient people, and I realised that, after all, we are descended from that hardy race which from the evidence available must have possessed a great measure of adaptability if they lived there all year round. Many ancient monuments in our land have disappeared in the march of time and of progress, but Grimspound remains an inseparable part of the moor, and like the Grey Wethers, it seems to be trying to tell us something of its long story. Such relics of the past certainly offer a wide field of interest and research to the antiquary. It was a grand walk home to Moreton, and before reaching Coombe Farm and the adjacent old mine workings we saw a stone avenue and more stone circles. They have their place, I suppose, in the absorbingly interesting history of this locality in which Grimspound plays the most prominent part.” – The Western Times, September 25th, 1942. Certainly Berry Pound is still smothered by bracken but no longer will one see the iron railings around the main hut circle and gone ore the two trees growing from the outer outer walls. I am not sure whether today one could describe the grass as being like a “carpet” or that one could see an “amazing abundance of whortleberries.” Possibly one thing or things that might make an appearance today which I’m sure would astound the author in 1942 are the odd Highland Cattle resplendent with their handlebar horns wandering around the lanes. Just a slight aside here, you will see that the author encounters members of the Perrott family who were descendants of the famous James Perrott. Oddly enough his great, great grandson Tom, who now lives in Tasmania has just visited Dartmoor (October 2017) – I wonder if he was one of the people the author met? “Of the large prehistoric pounds on the Moor this is the most frequently visited, for it is easily accessible and comparatively well preserved. It probably dates back to the early Bronze Age, say three thousand years ago...” John Hayward, Dartmoor 365, p.153.